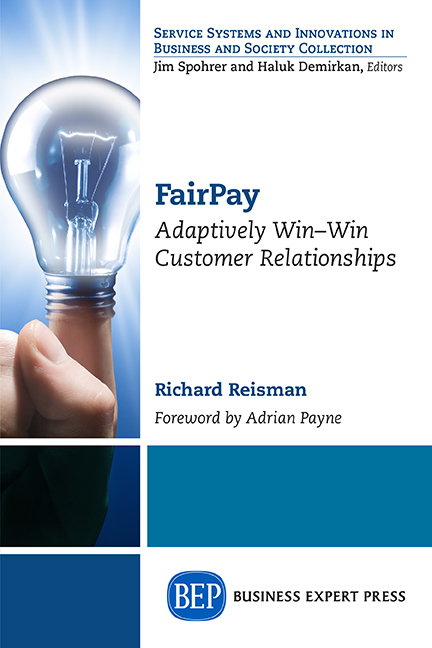 FairPay: Adaptively Win-Win Customer Relationships -- Richard Reisman's blog (now a book) on win-win ways to reinvent business, resolve the revenue crisis for digital, and create more customer/vendor lifetime value for all. Seeking value-based, customer-first relationships. 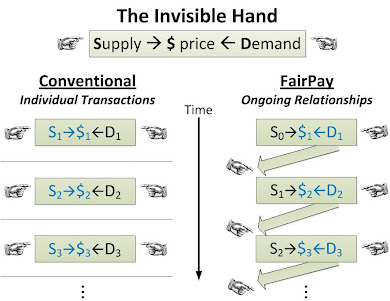 A one to one "invisible handshake" that brings commerce back to human values. Having recently heard a fundraising pitch by indie music distributor Nogeno, and looked at competitors like Bandcamp, I was again struck by the potential of FairPay pricing to change the game -- for the music business and/or the game business. Both music and games are dominated by the Apple iTunes Store, which disrupted the old distribution models. But there are many chinks in iTunes' armor -- one is that significant numbers of independent bands (and game developers)--and their fans--chafe at the economic constraints of the iTunes Store, and seek better ways to manage the value-exchange with their fans. Many indie artists and programmers have found Pay-What-You-Want (PWYW) pricing to be a surprisingly effective way to price, whether in temporary promotions a-la Radiohead, or as ongoing model. Indie distributors such as Bandcamp and Nogeno offer creators a range of payment models, including conventional fixed price and PWYW (with or without a minimum floor price). Bandcamp reports on their home page that "On name-your-price [PWYW] albums, fans pay an average of 50% more than whatever you set as your minimum." They offer additional guidance (and more) on using PWYW...and on drawing on the buyer appeal of the larger share they give to the artist. While PWYW is clearly effective at the margins, there are obvious concerns about its practicality for broad use. As explained elsewhere in this blog (see sidebar) FairPay adds a structured feedback process to enable a long view of pricing over an ongoing relationship, not just single sales, to make its "Fair Pay What You Want" model work far better and more broadly. FairPay is offered selectively, as a privilege to those who demonstrate that they pay fairly. An example of how this applies in the music business was in one of my early posts. FairPay is especially relevant to indie distributors, because their music (or games) are mostly Long Tail items (less mass-market), where PWYW and FairPay can be especially effective in increasing revenue, and where sellers are willing to take more risk to get wide exposure. The artists are struggling for recognition (and compensation), and fans feel stronger connection to these struggling artists, and want to compensate them for their creations. FaiPay enables the aggregator/seller to establish an entirely new infomediary role, as keeper of the FairPay Reputation Database that tracks how each of their individual buyers behaves in terms of pricing fairness. That database is much like a credit rating database--offering important data usable by any potential seller. This reputation data is what is used to determine whether a buyer pays fairly and should be entitled to make purchases on a FairPay basis (depending on the risk level implied by their reputation from previous purchases). The more complete the Reputation Database, the more effectively FairPay prcing works to maximize revenue and minimize risk. This second point offers distribution aggregators like Bandcamp and Nogeno to create a strategic asset that will differentiate them from competitors and raise a barrier to competition. Once FairPay gets critical mass, this database will have extensive pricing reputation data on many customers--something that will take time and money for a competitor to duplicate. The combination of both points offers a path to disrupting the dominance of the iTunes Store (and other mass-market aggregators). The Long Tail focus of the indie market will be especially supportive of the FairPay model, because of the greater willingness of sellers to take a risk on their buyers. The buyers will behave well because they will know they are supporting the creators of the product (artists and/or programmers), not the Apple 30% vig, or the suits in the studios. The initial success that builds will grow a FairPay Reputation Database that will increase the effectiveness of FairPay pricing and enable it to be used with decreasing risk for increasing numbers of products and buyers. That can greatly increase the appeal of the indie distributor, and widen its appeal to increasingly take share from iTunes and other mainstream aggregators. Of course iTunes can offer FairPay as well, and build its own database. The indies would still have the advantage of a higher share going to the artist, and thus a better value proposition than the big guys. Thus the indies might not take over the world, but--in any case--they could disrupt the current models in a way that makes a better value proposition to consumers and creators, and increases the net opportunity for indies. Overview of FairPay -- Start Here! "Anyone responsible for monetizing digital content in consumer markets should understand this radically new perspective on pricing and how to maximize lifetime customer value." "...an innovative and visionary methodology …what disruption could look like..."
"...compelling ...promises to transform business..."
"Highly recommended for digital business entrepreneurs, as well as established firms..."
Let the Customer Set the Price"
it is to act with yesterday's logic." 1. Set the rules (Seller). As usual, the seller sets the ground-rules of the game, but in this repeated game, the rules favor fairness, transparency, and cooperation on both sides. The seller decides to whom to make a FairPay offer, on what terms and conditions. FairPay offers are a privilege that can be granted or withheld. 2. Set the price (Buyer). Reversing traditional practice, the buyer is granted the power to set the price to whatever value-based price the buyer considers fair -- after the sale, when the real value is experienced and known. 3. Repeat the game? (Seller). This seller power is what makes FairPay work, balancing the power of the buyer to set the price. 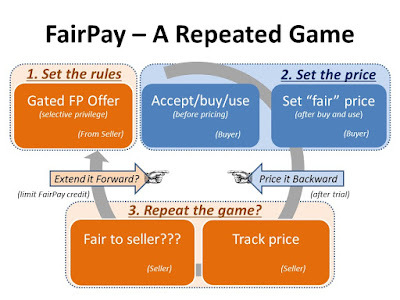 The seller tracks the price, and determines, in the context of the overall history, whether it seems fair enough to the seller to continue the FairPay game for another round. The buyer knows this is a repeated game, and must consider the consequences when exercising his price-setting power. That motivates the buyer to price reasonably fairly. This builds a relationship based on fair value exchange, that adapts and evolves over time. The seller manages "dialogs about value" that frame the value that was delivered, and a suggested price for that -- and nudge the buyer to be generous by offering more value for more generosity. This repeated game structure gives buyers a strong incentive to price fairly – and enables sellers to limit their future exposure to those who do not. More broadly, it shifts the entire focus of customer relationships from short-term transaction price to long-term relationship value. Delight your customers: give them what they really want, at a price they really think fair. Shift the conversation from price to value, and from transactions to relationships. Empower them to engage with you and tell you what they value. Make commerce a repeated game that drives value creation to build a profitable relationship with high Customer Lifetime Value (CLV). ...This sample offer letter to consumers shows how a newspaper might frame FairPay as a privileged benefit to regular patrons – to enable them to participate in a win-win pricing process and personalize their value propositions – as an alternative to a standard freemium "soft paywall." ...The answer is simple: Buyers who do not pay will not get further offers. HBR Blog Post on FairPay: "When Selling Digital Content, Let the Customer Set the Price"
Reisman is working on FairPay on a pro-bono basis, welcomes inquiries about it, and offers free consultation to those interested in evaluating and applying it. Please email to fairpay [at] teleshuttle [dot] com. The FairPay Zone Blog by Richard Reisman, Teleshuttle Corp is licensed under a Creative Commons Attribution-Noncommercial-Share Alike 3.0 United States License. Based on a work at FairPayZone.com.